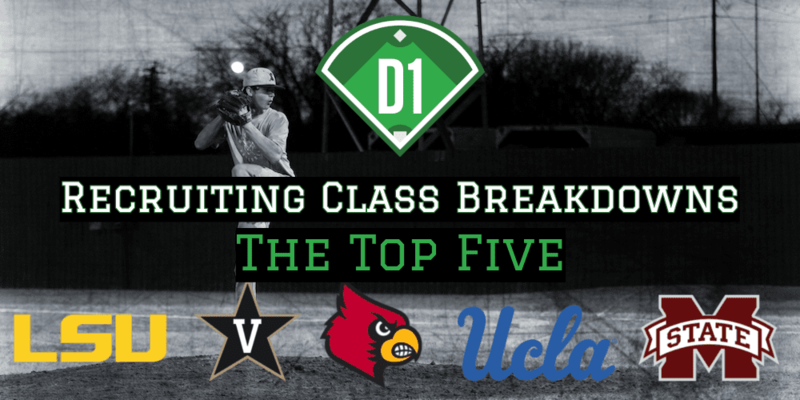 Here’s our breakdown of the newcomers for the top five teams in our recruiting class rankings: LSU, Vanderbilt, Louisville, UCLA and Mississippi State. Total Recruits: 16 (13 freshmen, 3 JC transfers). The Tigers recruit at an elite level every year, but this class looks special even by their lofty standards. LSU landed four top-100 PBR Top 100 prospects who could have been high-round picks if not for their strong commitments, and this class has elite depth to match the high-end star power. The highlight of the class is a trio of blue-chip righthanders: Jaden Hill, Landon Marceaux and Cole Henry. Hill is a top-of-the-charts athlete who drew more than 10 Division I football offers but opted for baseball at LSU, where he should become a front-line ace thanks to his natural strike-throwing ability, stellar changeup and low-90s heater that has touched 96. He still has some rough edges that need polishing, and the key to his development is refining his breaking ball, which has promising spin and shape. Henry has similar upside, with a low-90s heater that bumped 97 early last spring, a curveball that flashes plus and an advanced changeup.